We are delighted to tell you about our newest collaboration. We have teamed up with some of the best energy co-operatives in Ireland to help develop a new community-based virtual power plant. The basic idea is that an energy co-operative builds a wind or solar farm, a hydro plant, an anaerobic digestor, a solar roof, whatever suits them best - and then sells the energy it generates back to its residents, businesses, community centres etc. This will help build local jobs, ensure local money stays local, and help communities save on carbon emissions. It really is a win-win for communities and the climate. Look out for the launch of a new utility in early 2019. That's not all though. To celebrate and kick off some community renewable projects, we're running a competition! We're looking for 5 Irish schools to become Solar Schools. We're doing this because Irish energy policy is so far behind. Solar producers usually have to give their extra power away for free, and we all know rooftop solar is not yet a great investment in Ireland, taking on average 15 years to break even on initial investment. This is even more true for a school as schools close during the Summer. So, to overcome the cost barrier, we will fund 90% of the costs of installing solar panels on 5 lucky schools in 2019, and can arrange for the sale of any extra power generated. Solar Schools will save money, make money and reduce emissions! Win. Win. Win. If your school is located in our pilot areas (Claremorris, Aran Islands, Tipperary, Limerick, Dublin) - register your interest in the online application form here by November 30th 2018. All you need to do is come up with a good activity for your school to do on solar energy and climate change. The Sick of Plastic Campaign has been one of our most popular campaigns in terms of public engagement, which goes to show - people really are sick of plastic! 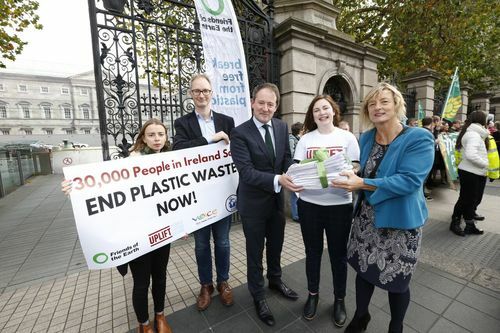 On October 23rd, together with many of our supporters, we delivered a joint petition of 30,000 signatures with Uplift to the Dail ahead of a motion to move the Waste Reduction bill forward. Half of these signatures came from Friends of the Earth supporters (you guys! ), between Electric Picnic, online actions, and signatures gathered at the Sick of Plastic Day of Action in April. Thank you so much! However, although the motion was accepted, Richard Bruton and Fine Gael TDs are still not ready to support the deposit return scheme. We will continue to put the pressure on to ensure Ireland cleans up its act on waste. But we do have good news! Just days after we delivered our plastic petition to the Irish government, the EU made great progress on plastic legislation which is working to reduce litter, ensure industry takes responsibility for waste and encourage sustainable design. Thankfully, we’ve moved one step further on EU Plastic Legislation as a ban will be placed on a number of single use plastic items including polystyrene food containers, straws, cotton buds and cutlery. Another win! It was encouraging too to see MEPs (Member of the European Parliament) supporting recycling collection targets of 75% by 2025 and 90% by 2030. Unfortunately, Ireland’s current collection rate is 35.7% and we are the top producer of plastic waste in Ireland, producing a massive 61kg per person a year. Fine Gael’s plan is to increase the low figure to a mere 55% by 2030 - not very ambitious. We believe that the only way to reach EU targets is to introduce a deposit return scheme to provide recycling collection for on-the-go waste. Our work at Electric Picnic proves that it works. For the past three years we have been running the cup return stations at Electric Picnic, and at Body&Soul for the past two years. Putting a levy on plastic makes people see the value in this material, and getting a reward for recycling encourages people to do the right thing. It’s a win-win situation. 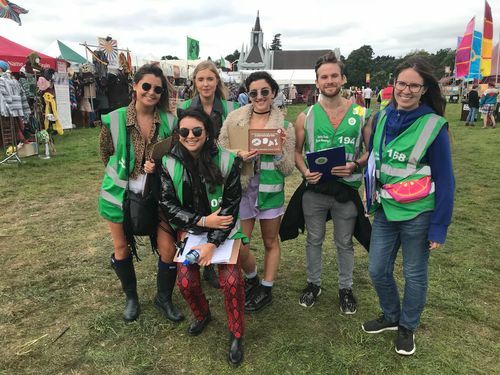 We’d like to give a big shout out to our amazing team of Green Messengers this year for doing such a great job in helping salvage as much recyclable materials as possible and spreading awareness about plastic waste to festival goers. 2019 will see lots more action on plastic, that’s for sure! If you’d like to become more active in the Sick of Plastic campaign, you can sign up here at this link. It is evident from two very successful recent climate protests that the public is hungry for climate action. 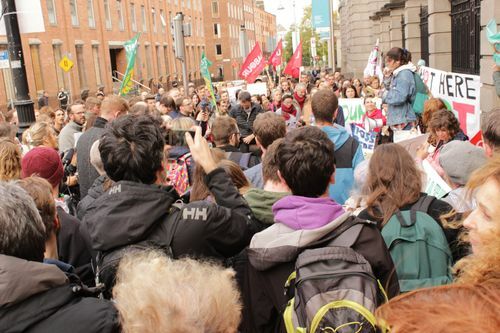 Media reported 300+ people gathered outside the Dail on October 16th demanding #ClimateActionNow following the IPCC report and Irish budget. This protest was organised in just a few days by the Dublin Ecofemnist Coven, Young Friends of the Earth and supported by Stop Climate Chaos. One month later another protest, organised by various organisations and groups, was held in solidarity with the Extinction Rebellion global day of action on November 17th. Media reported 500 people in attendance just in Dublin, with hundreds gathering in Galway, Cork and Belfast too. Both actions were calling on government to address the 13 recommendations from the Citizens’ Assembly on how Ireland can tackle climate change. Unlike government, we know people are ready for climate action. That's why we're part of a climate coalition that is organising a lobby day in Buswells on December 5th to allow constituents have face to face conversations with their TDs about climate. Stop Climate Chaos has run extremely successful lobby days in the past and know this will be no different. Register now and email your TDs via the link below. We hope to see many of you there! 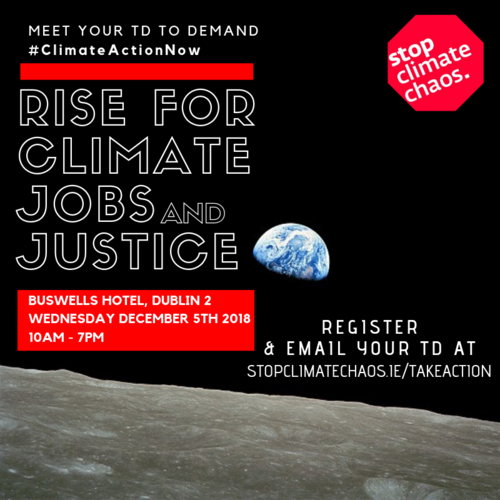 Sign up to Rise for Climate, Jobs & Justice! In other activism, Meaghan (Head of Mobilisation) joined Not Here Not Anywhere for their national strategy meeting in Tullamore to discuss how we can support the resistance against LNG in Shannon, read more about that here. Meaghan also joined the All Ireland Student Activist Network in Cork for 'Rise' - a weekend of workshops and trainings to build and strengthen the growing grassroots movement in Ireland. November 8th saw us launch our Winter education course, Mobilize.Resist.Transform. 2018 - An Introduction to Environmental Issues. This is the second time we have run this course and we hope to grow it even more next year. We’ve 23 engaged and enthusiastic participants of all ages and experience from Ireland and abroad! We're excited to see where the participants direct their energy during and after this course!We are due to launch an online course next Spring, so keep your eyes peeled for the application form for that. In early November Meaghan, our Head of Mobilisation travelled to Rome with 49 other European participants for the first Partners Meeting of a huge European project we are part of - Citizens for Financial Justice. The overall objective of this project is to inform, connect and empower citizens to act together to make the global finance system work better for everybody. Our project, ‘Finance: Fueling Climate Change?” will contribute to citizens feeling empowered to take meaningful action on climate, to take on the behemoth of corporate finance and perceived impunity that is causing such degradation to the Earth’s climate. The project is 18 months long and will give us an opportunity to explore a new area for Friends of the Earth: research, advocacy and educational work on the impact of financialization on the climate. It is early days for this project, but it looks like we will be looking at the ESB’s role in importing 90% of the coal burnt at Moneypoint from a mine saddled with hundreds of human rights abuses in Colombia. What’s more, we will be working with European groups such as the Gastivists Collective and Platform to explore the companies involved in the gas supply chain in Europe, and what with Ireland planning to import fracked gas from the US via massive ships to be processed at a proposed Liquefied Natural Gas terminal in Shannon, this project couldn’t come at a better time. In October and November, we gave two workshops on Environmental Sustainability: One in UCD and one in DCU, as part of SUAS’ STAND Global Issues Course. 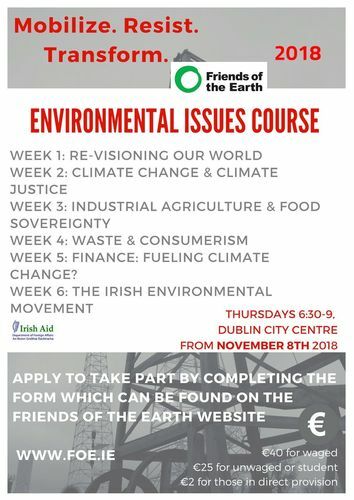 In these sessions, we aim to increase understanding of the concept of environmental sustainability, we explore the concept of justice in the allocation of the worlds’ resources, identify the causes and effects of climate change at a local and global level, and explore opportunities for taking action. Young Friends of the Earth - New project and new employee! We were successful in applying for a Young Friends of the Earth Europe project which has allowed us to take on a new employee to manage this project. A very warm welcome to Triona Reid!Triona will be managing this two-year project, the aim of which is to empower rural youth in Ireland to take action for creating a fairer food system. Triona will be working closely with Young Friends of the Earth who have been running a Food Sovereignty campaign, ‘Chew on This’ for the past year and are seen as somewhat experts on the topic by the Young Friends of the Earth Europe groups! Triona and three Young FoE members travelled to Denmark for the kick-off event this month, keep an eye on our social media for upcoming food-related events that you can get involved with. P.S: If you live nearby, or happen to be passing through Dalgan Park in Navan, pop into The Columban Ecological Institute for their 'Scourge of Plastics' event on Dec 1st from 9.30am - 3.30pm organised by Friends of the Earth supporter Sean McDonagh. Attendance is €30 (or €10 for students) and includes lunch.